Research has change over the years. It began as pastime for the wealthy. Early research scientists had no economic pressure and simply searched for the truth. Today, research is done in schools, and private and government labs: a subtle but significant change. This research requires external funding. External funding comes with a price. If the researchers’ conclusions do not agree with the funding party’s ideological or political views, no further funding will be provided. For example, the Paired Watershed Study was cancelled because the early results of the study did not agree with the fund provider’s beliefs on improving the salmon runs. Without funding a research organization ceases to exist. Money Talks. While this makes good economic and political sense, it does not make good science. To avoid these problems, NPR has adopted a policy of refusing external funding. This allows a return to the original principles of early research. Presently most of our work is independent reviews of the research performed by others. Most people only look at the conclusions of a scientific paper. That is certainly a quick way to read a report, but assumes that the person doing the research has made correct assumptions, used a procedure which accounts for all variables, controls all variables, makes no errors in gathering the data, or the analysis, reaches conclusion that are correct and logical, and considers all alternate conclusions. In the present research environment, this is a little naïve. To correctly judge the veracity of the research, it is necessary to look beyond the conclusions to satisfy oneself that good science was used and that the conclusions are factual. That is difficult for the average citizen to do. Global warming is receiving a lot of press and being championed by politicians, activist groups and the press. This is not conducive to good science or correctly solving the problem. Science is not a political issue that can be solved by democratic principals. In science, the correct answer is found by using the scientific method. Something that is difficult to do in biology. The figures to the right show temperature data from one of these papers and a satellite image of greenhouse gas concentrations from another. Examination of temperature data shows a temperature variation over the last 400 K years of about 10° C and a carbon dioxide variation of about 100 ppm or about 0.01%. This curve also shows very definitely that three times during the last 350 K years, when the carbon dioxide content reached 300 ppm the global temperature plummeted 8 degrees. 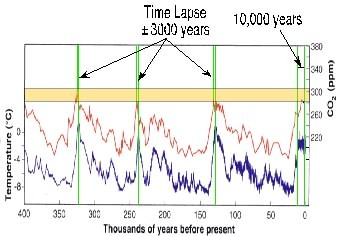 It is also shows that the temperature change was not instantaneous but lagged the CO2 increase by ±3000 years. About 10 K years ago, this relationship suddenly changed. The temperature curve ceased climbing and began to oscillate. What caused this change? Ignoring history can be dangerous. Recent evidence shows that all green plants produce large amounts of methane. The major producers are tropical forests an wetlands. Methane is 23 times more potent as a green house gas than CO2, and produces over twice the pollution effects of world industry. Can we afford to ignore methane’s contribution on global climate? Do we know enough to mess with complex environmental systems? 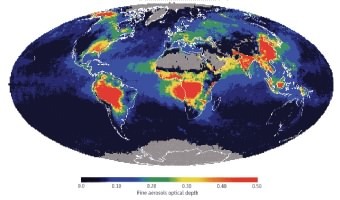 The second figure shows that four of the large concentrations of greenhouse gas, (dark red areas), are indeed located over the Amazon, African, Indian and Indonesian rain forests. This validates the conclusions of the methane paper referenced above and indicates that the major producers of green house gas are the large heavily forested areas.